Today let's take a peek at winter fashion from 1966. 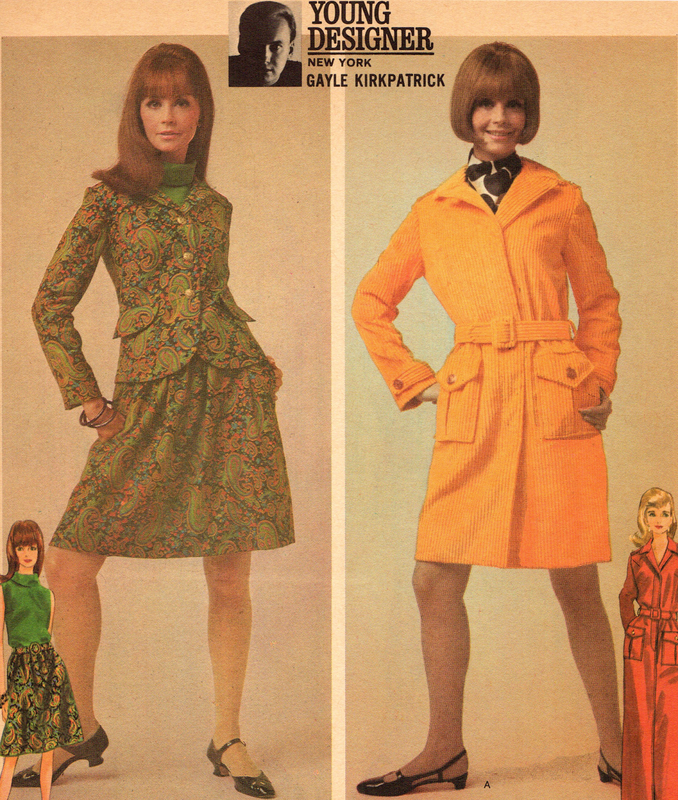 Gayle Kirkpatrick was a hot "In" designer from the mid-60s to the late 1970s. During that time, he won a Coty Award, and designed for Butterick, among many other things. Here are a couple of his designs for Butterick from 1966. The coatdress could be sewn to be a coat or a dress (or both!). In this interpretation, sewn in wide wale corduroy, it definitely looks like a coat, with military details. The double image below pairs Butterick 4204 with Gayle Kirkpatrick's Blouse and Suit Butterick 4205 (looking darn cute and perfectly Mod in paisley). Note the "power stance" of the models. No demure crossing of legs in the youthful revolution of the Mod years!